With bubbles, squirt toys and lots of splashing, bath time is always a highlight in our house. My daughters enjoy taking baths and I love helping them unwind for bed with an easy routine. JOHNSON’S® bath products have always been my go to, and now they’re newly reformulated to be 100% gentle, and free of parabens, and phthalates. My husband recently deployed overseas (read all about that here) and we’ve been struggling to find our new normal. Prior to his departure, bath time with two little ones was something we previously tackled together so developing a new routine as a solo parent has been challenging, especially with a 3 and 1 year old. 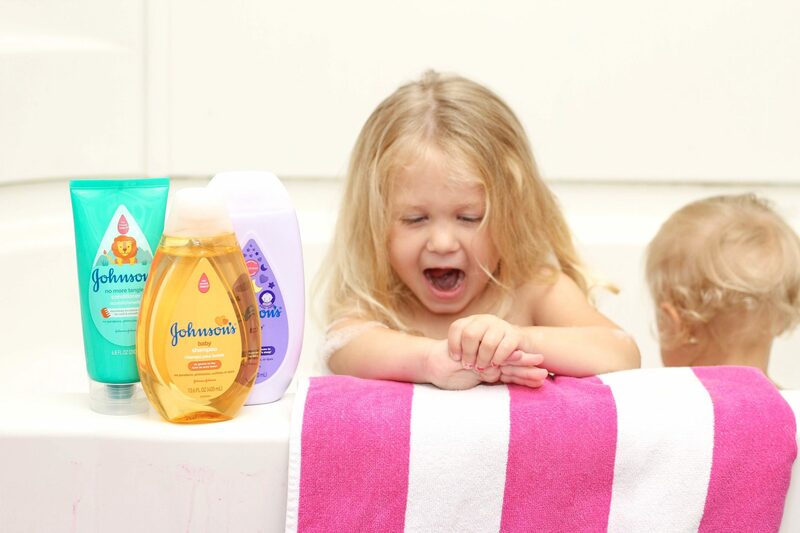 I am so thankful we have JOHNSON’S® bath products to rely on for an easy routine. I love the soothing smells of JOHNSON’S® Bedtime Bath. The lavender helps signal bedtime for my girls and they love playing in the bubbles. 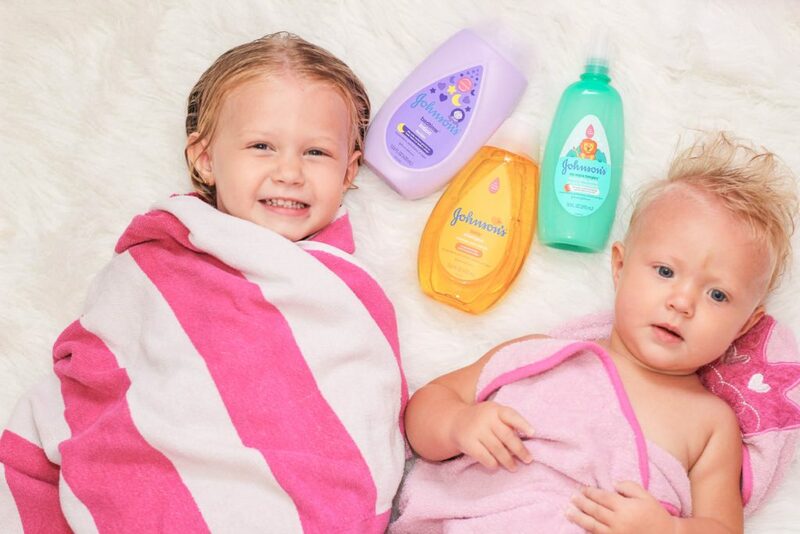 JOHNSON’S® Baby Shampoo is perfect for both my infant and toddler. The tear free formula is gentle but still cleans great. We all know how kids end up with the craziest things (food, Playdough, paint, etc) in their hair. The Baby Bedtime Lotion has such a soothing scent and keeps my kids skin nourished and soft. Lastly, the No More Tangles Spray is a miracle worker in combing through my daughter’s hair without fuss. Figuring out how to bath two tiny humans was a challenge when we first brought home my second born. For the first several months, it consisted of two separate bath times, one for the newborn and one for the two-year-old. Since they’re older now, it’s more practical for them to bath together. I love watching them play and splash with each other, but that doesn’t mean it comes without challenges. Here’s my tips for bath time with two little ones. Have a Game Plan. Think through which kid should be taken out of the tub first or if they will both be taken out at the same time, etc. It sounds kind of silly, but knowing who’s coming out first and how you will dress that child (while still watching the other one) can be more challenging than you think. 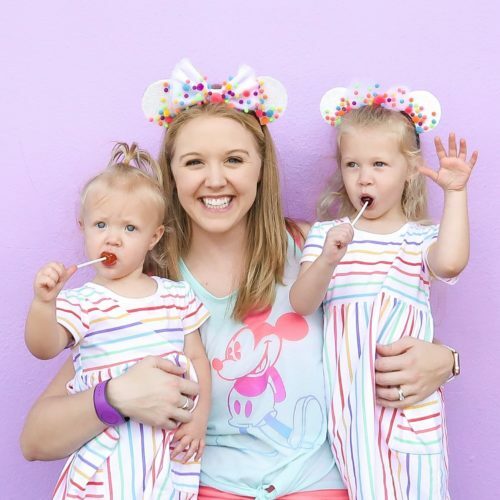 It took us several nights before we found a routine that worked for us, and it’s changed as my kids have changed too! Assembly Line. It’s easy to think of all the aspects of bath time as an assembly line, especially when you have more than one kid in the tub. Find a rhythm that works for your kids and do everything one after another for maximum efficiency. Make Bath Time Fun. Whether it’s bubbles, bath paints or fun squirt toys, little kids need a reason to be excited about bath time! This makes it less of a chore for you and more enjoyable for your kiddos. I never have to fight my kids to take a bath, they both come eagerly running when they hear the water turn on. Be Vigilant. Mere inches of water in a bath tub can cause a child to drown. Little kids don’t always understand the implications of what they’re doing so it’s important to stay alert and never turn your back while they’re in the tub. As a new mom, there are so many decisions that have to be made. When it came time for baby’s first bath, I knew what we would choose. JOHNSON’S® is already the # 1 choice of Hospitals so it’s the obvious choice for my family too. 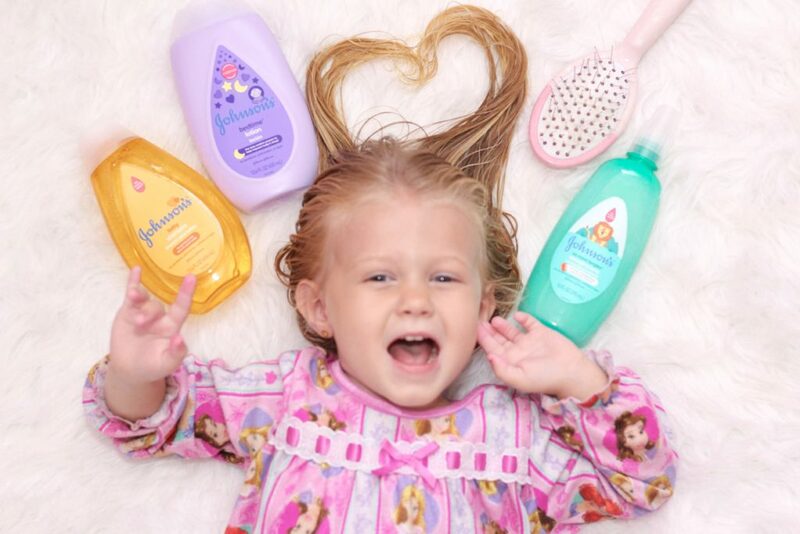 From newborns to toddlers, I love that JOHNSON’S® is a brand that really grows with my kids. It’s what I always trusted on my newborns skin, but also what I rely on to keep my toddler’s hair clean and tangle free. 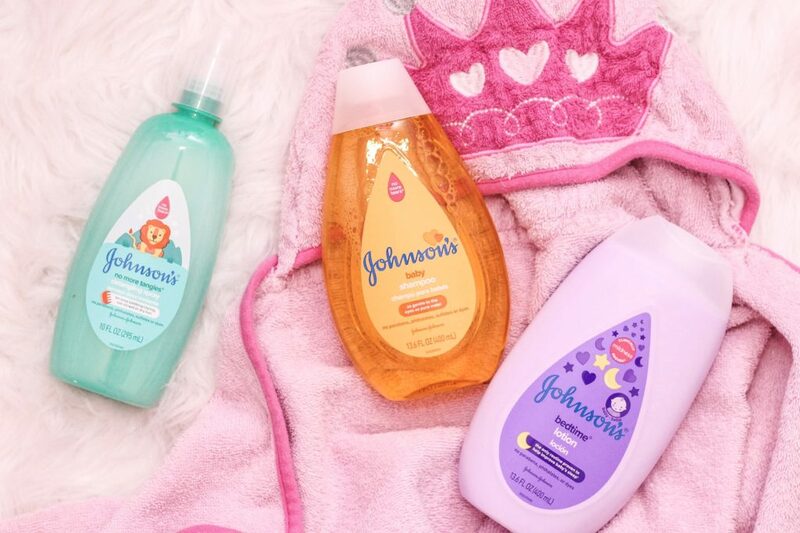 Although JOHNSON’S® has been around for over 100 years, the newly revamped line of baby products have evolved to ensure they’re still the best for modern moms. It’s “The Brand You Trust, Now More Gentle Than Ever”. JOHNSON’S® bath products are new and improved, inside and out. They maintain the safest ingredients while also staying true to the brand people have come to trust. The newly reformulated line is dye free, sulfate free and worry free for new moms. In fact, it has 50% fewer ingredients with over 90% of them being naturally derived. I remember in those foggy weeks after having my second daughter, we survived on quick trips to Walgreens. It was so easy to get in and out and find the things we need. On one specific night, she developed a fever and I realized we had no kind of infant medicine at our home. Luckily, I was able to make a quick stop at my local Walgreens to grab what I needed to take care of my baby. The staff is always so friendly, especially the pharmacist when I have questions about medicine for my daughters. Whether it’s Tylenol for a fever stricken kid, diapers when I’m running low, or grabbing a quick bottle of JOHNSON’S® Baby Shampoo before baths, I know Walgreens is a trusted place to shop that always has what I need. 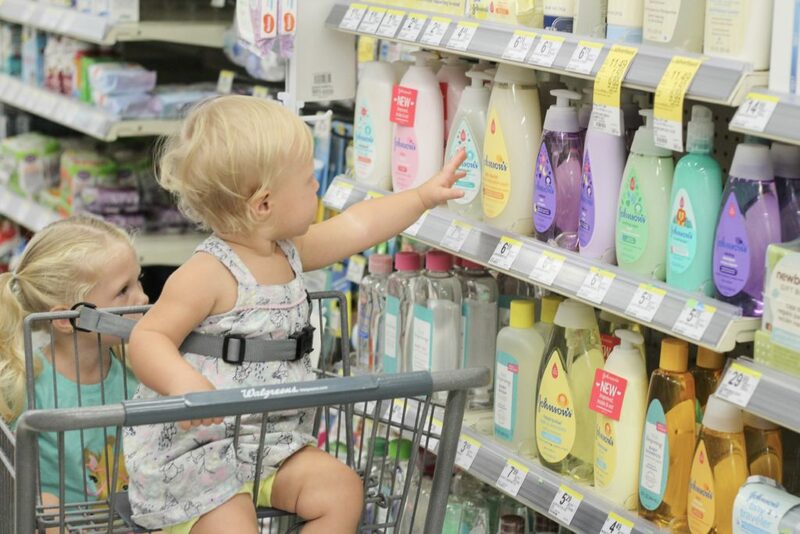 JOHNSON’S® Baby Products recently relaunched at Walgreens. Look for it in the baby section with all new bottles. Now through 9/22, you can save $1 on any 1 JOHNSON’S® lotion, wash, or hair care item, CLICK HERE to get the coupon!